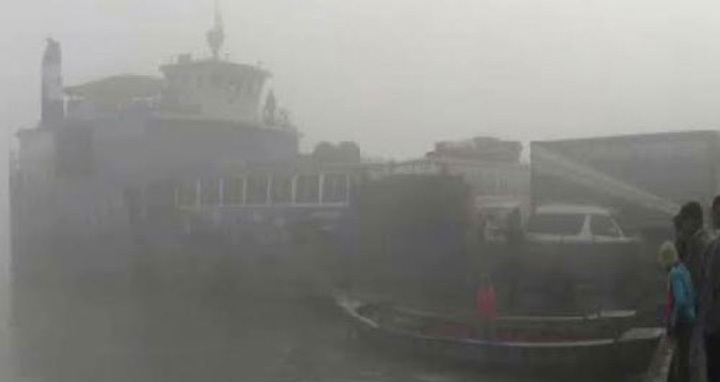 Dhaka, 29 Dec, Abnews: Ferry services on Paturia-Daulatdia route in the Padma River were disrupted for three hours due to heavy fog on Friday morning, leaving 11 ferries stranded in the mid-river. “The ferry services were disrupted from 11:30 pm due to poor visibility caused by thick fog,” said Nasir Mohammad Chowdhury, manager of Bangladesh Inland Water Transport Corporation (BIWTC) at Aricha. Over five hundred vehicles, including buses and trucks, were waiting in queues on both sides of the river to cross it, he added.